There are strong hints of summer’s impending arrival in our part of the South, with the weather getting ever warmer and daylight stetching longer and longer. Our vegetable garden is humming along, soaking in sunshine and bursting with new blossoms and quickly-developing fruit. The rampant humidity that clings heavily in the air during the summer months is sneaking in too, bolstered by the rising temperatures. Something about it, or maybe just because the Honey is still away, has me feeling a bit nostalgic this week. I’ve been thinking back to nearly a year ago, how, stepping off the plane in Georgia – still dressed for chilly, foggy San Francisco – the steamy, stifling air hit me like a ton of bricks. My mind raced as I trekked through the airport towards baggage claim, so looking forward to seeing my Honey there waiting, and all-the-while wondering what this new place would really be like; whether living here would be anything like visiting, and if my leap of faith would leave me on solid ground. Those worries were unfounded, and we have built a happy little life together here in the South, and well, maybe all of this is just a drawn-out way of saying that I miss him. I knew what his job entailed from the beginning; that there would be long periods of time when we are apart, of me missing him. Still, there are moments, and days, when the evening air is warm and welcoming, and my pragmatism is trumped by emotion and I just wish he was here. The cure for such sentimentality is always to cook something comforting, and I set about making a new, hearty veggie burger recipe, starring my very favorite vegetable: the sweet potato. 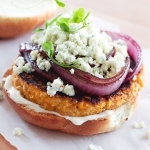 The result is a healthy and flavorful sweet potato and quinoa burger, topped with big rings of caramelized red onion and a generous sprinkling of blue cheese, perfect for warm summer nights, with – or without – your Honey. Bring a large pot of water to a boil, then add the sweet potatoes and cook, stirring occasionally, until fork tender, about 15-20 minutes. Drain and set aside to cool. In a large mixing bowl, stir together the sweet potatoes, quinoa, panko, egg, garlic and spices until well combined. Form into four flat patties, about 3/4-inch thick. Heat 1 tbsp of the olive oil in a griddle or large skillet over medium-high heat. Cook the patties until they reach a deep golden brown and are cooked through, 4-5 minutes per side. While the patties are cooking, heat the remaining olive oil in a medium skillet over medium-high heat. When the oil begins to shimmer, add the balsamic vinegar, and stir to combine. Add the onion slices to the skillet, leaving a bit of room between each. Cook for 3-5 minutes, flipping once, until the onions have softened. Top each bun with a burger, and divide the onion rings and blue cheese among them. Top with desired condiments and serve warm. Made the sweet potato and quinoa burgers. They are awesome. Even my son enjoyed them. Thank you. My husband and I just made these for lunch. We love them! The texture is perfect. It’s nice to have a base recipe that sticks together well. Next time we’re going to try swapping chile powder for the cumin and cheddar for the clue cheese. (My husband never leaves a recipe alone, no matter how much we like it!) thanks for the great recipe! Hi Laura, this is the first recipe I’ve tried from your website. It was really good, even better than expected. I was skeptical about how well the burgers would hold together, so I mashed the sweet potatoes a bit against the side of the bowl as I was mixing, but that was probably unnecessary as they held together really well. We topped them with Muenster instead of blue cheese and a bit of hot sauce. I made them for my husband and brother, and they both loved them. I will definitely be making these again! I made these tonight for dinner. Really good. I was looking for a little more crunch, though, so I I think I’ll really toast up the buns next time. I also tried adding buffalo sauce to half the batch, and it turned out really well! Hi Nancy, I’m glad you enjoyed the recipe! That’s a good call on toasting the buns – I almost always toast burger buns, but neglected to mention that in the recipe! Did you mix the buffalo sauce into the patties or use it as a garnish? So excited to make these for my family tonight! What do you recommend for condiments? Hi Olivia! I like to keep the condiments pretty simple, because there are already a lot of flavors going on with the onions and the blue cheese. A little mayo or dijon and some Spring greens are all you need! I hope you like them! 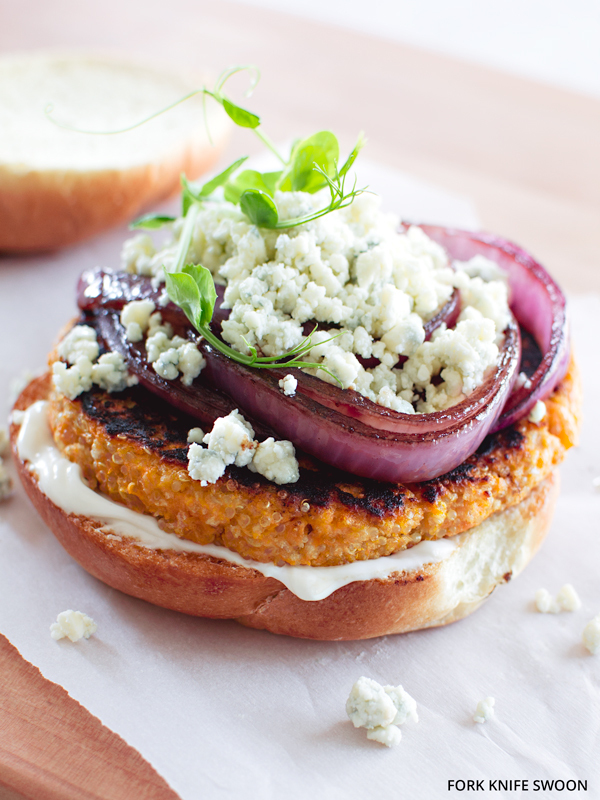 These burgers sound so incredible, and I LOVE that there’s sweet potato in them. I’m with you on being a big sweet potato fan. I’ll have to try these! It was definitely a big move! My heart will probably forever love California. Someday we’ll be back on the west coast! I hope you try these…they are definitely for the sweet potato lover! Another fabulous sounding meal I can make for my vegetarian son when he next visits! This sounds delicious! Thanks for the great recipe! Can’t wait to try it!